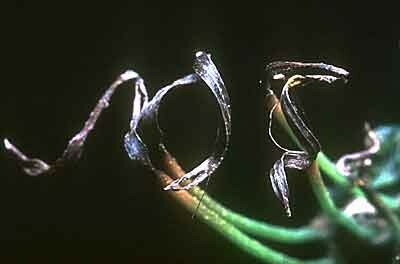 Hornworts are named for the horn-like appearance of the spore producing plant (sporophyte). 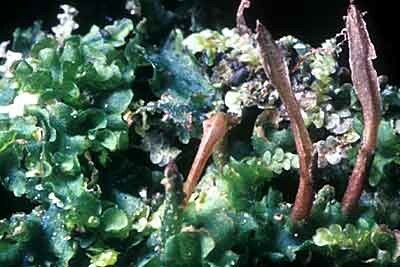 Hornworts belong to the phylum (division), Anthocerophyta. There are only about 6 genera and 100 species distributed thoughout the world. The genera Anthoceros, Dendroceros, Megaceros and Phaeoceros are widespread in New Zealand, capable of forming dense colonies where conditions are suitably moist and sheltered. The six species found in New Zealand are endemic (found nowhere else). 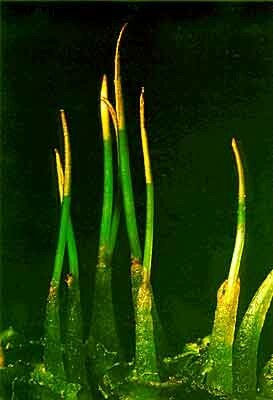 Hornworts have a flattened growth form lacking leaves and stems. This is called a thallus. The thallus of most species has a mutually beneficial (symbiotic) relationship with colonies of a cyanobacterium, Nostoc, that inhabits cavities in the thallus. 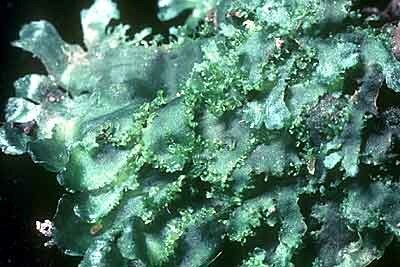 Nostoc provides a source of organic nitrogen which enables hornworts to grow on poor soils. Anthoceros sp. 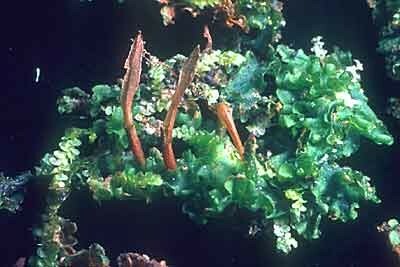 The flattened prostrate and lobed thallus often resembles that of a thalloid liverwort, making identification of hornworts problematical without the presence of fruiting bodies (sporophytes). Very common on exposed, damp banks. Megaceros giganteus The strap-shaped thallus of this species often has frilly extensions along the margins. It is found on moist rock and excessively wet soil. 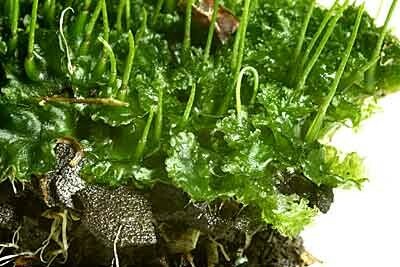 The archegonia (egg cases) are embedded in the hornwort thallus and when fertilised give rise to a spore-bearing plant (sporophyte) that has the form of a cylindrical 'horn'. Phaeoceros sp. Each embryo forms a spore-containing horn that increases in length by growth that is localised at its base.